OAKLAND, Calif., April 24, 2012 /PRNewswire/ -- WONKA, maker of the world's most imaginative treats, today announced its latest invention: Wonka™ Ice Cream, featuring a scoopendous line of deliciously innovative flavors inspired by the beloved novel. Made with imagination as well as the finest ingredients, the all-new super premium ice cream line swirls together unexpected yet marvelous combinations of flavors, textures and top-secret, unique ingredients that are distinctively Wonka ice cream. The indulgent treat delights the senses and leaves connoisseurs of creamy concoctions clamoring for more. To further deliver the fantasy and fun that fans have come to expect from the Wonka brand, the scrumdiddlyumptious invention literally turns the concept of everyday ice cream on its head—hitting grocery freezer aisles in visually arresting, inverted cartons. "Imagination drives everything the Wonka brand does, and our new ice cream line captures this ingenious spirit and whimsy for people of all ages," says Tom Kim, Wonka 'Master of Swirl.' "From the very first taste of Chipperberry Swirl™ to the last of whiptastic Kerfuffle Truffle™, our delicious ice cream creations allow everyone to experience a sense of wonder and amazement with each delectable bite." Wonka Ice Cream is now available in select grocery stores throughout Northern California and Reno, Nev., – including Safeway, Raley's, SaveMart, Lucky, Walmart, Target, CVS, 7-ll, Chevron, Lunardi's, Gene's Fine Foods, Draeger's and Key Markets – at a suggested retail price of $4.99. 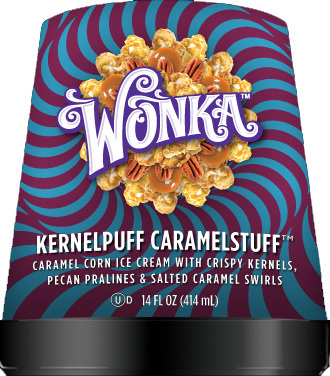 For more information about Wonka Ice Cream, or to locate stores in your neighborhood where its splendiferous new flavors have recently been delivered, please check out the Wonka flavor finder at http://www.wonkaicecream.com. WONKA® opened its doors in 1983. Since that time, WONKA® has been dedicated to the art of producing fun, innovative, high-quality confections for candy lovers of all ages. WONKA® candies include NERDS®, NERDS® Rope, SWEETARTS®, SHOCKERS, SPREE®, LAFFY TAFFY®, RUNTS®, EVERLASTING GOBSTOPPER®, LIK-M-AID® FUN DIP, PIXY STIX®, BOTTLE CAPS®, KAZOOZLES™ and GUMMIES. THE WILLY WONKA CANDY FACTORY is owned by Nestle USA, Inc. For more information about WONKA, visit WONKA.com. Named one of "The World's Most Admired Food Companies" in Fortune magazine for fifteen consecutive years, Nestle provides quality brands and products that bring flavor to life every day. From nutritious meals with Lean Cuisine® to baking traditions with Nestle® Toll House®, Nestle USA makes delicious, convenient, and nutritious food and beverage products that make good living possible. That's what "Nestle. Good Food, Good Life" is all about. Nestle USA, with 2011 sales of $10 billion, is part of Nestle S.A. in Vevey, Switzerland — the world's largest food company with a commitment to Nutrition, Health & Wellness — with 2011 sales of $94 billion. 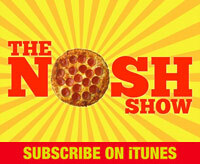 For product news and information, visit Nestleusa.com or NestleNewsroom.com. Whoa! I am smiling like an idiot, also at a loss for words. This is exciting though! Holy smokes they all sound great... being Wonka they should never melt, or at least change flavor a few times. Someone in Norcal give one a try! "liquid chocolate chips" in the raspberry one!